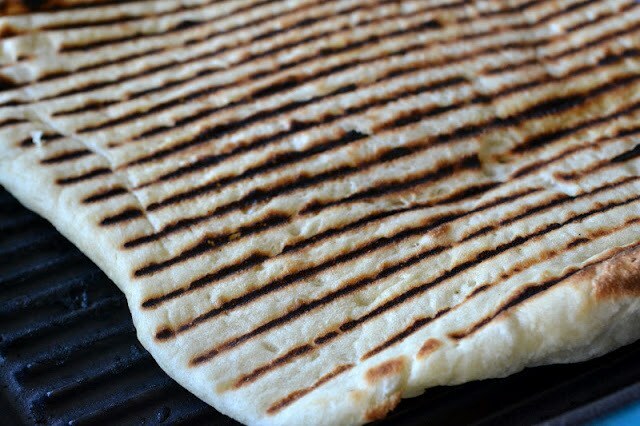 Laffa Bread: Combine the dry ingredients. Add the oil and water and if you are using a food processor process for about 60 seconds until a very smooth, soft, and slightly sticky ball forms. If using a mixer, mix with the dough hook until the dough is very smooth, soft and elastic. If making by hand; after you add the liquid ingredients to the dry ingredients, mix by hand in the bowl for a few moments until well combined and coming together. Turn the dough out onto a lightly floured surface and knead for about ten minutes until smooth and elastic. In all cases after the kneading, place the dough in an oiled bowl and loosely cover with plastic wrap. Then cover the bowl with a tea towel and place it in a draft free warm corner so the dough may rise. In about an hour, when the dough has doubled or more, punch the dough down. Divide the dough into 10-12 equal balls, and then roll the balls until smooth. Place the balls on an oiled cookie sheet. Cover them with a damp tea towel and let the dough balls rest for about ten minutes. Resting makes the dough easier to roll out. Pre-heat a grill pan to medium. I found that the large non stick grill pan was the easiest to work with. Take a ball of dough in your hands and flatten it out on an oiled wood surface. Roll it out with a rolling pin or use your hands. Make a circle about 12 inches in diameter and place the Laffa on the hot grill surface. When you see the edges looking dry and the bread is poofing up turn it over. Laffa only takes a few minutes to grill. Place the finished Laffas in between some kitchen towels to keep warm. Hummus: Put the garlic and chickpeas in a food processor or blender and process for 2 minutes, scraping down the bowl as necessary. the mixture will be very dry at this point. Add in the tahini and lemon juice and processes until smooth. Add a little bit of cold water the thin the hummus if it is very thick. Season to taste with salt and pepper, and add more tahini or lemon if you like. Spoon the hummus into a shallow bowl and top with a drizzle of olive oil and some toasted pine nuts.